If you have aging parents, you’ve probably given some thought to their future care needs. You might even be wondering whether it’s time to consider an assisted living community. Often, though, it’s tough to even start the conversation. Older adults might be reluctant to leave their existing homes, and they may not take kindly to the suggestion that they need extra help. In other words, it’s a touchy subject. Yet the sooner you start having the conversation, the better prepared you and your loved ones will be when it’s time to make the move. These 7 tips can help you broach this difficult topic. 1. Start talking early: It’s never too soon to start planning ahead. Many adult children wait to bring up retirement communities until something happens, such as a parent falling or missing medication doses. If you start looking at senior living options early, you will have more time to make the best decision for your family – before a crisis occurs. 2. Consider your audience: All families are different. There is no one right way to initiate a discussion about senior care. Some people like to be direct. Others need a more delicate approach. Sometimes, one spouse is ready to move out of the family home, but the other is not. You might have to help your reluctant dad realize that moving into an assisted living community is the healthiest option for your mom, for instance. In many cases, it can help to speak to your mom and dad separately. Getting one of them onboard can help you raise the topic with the other. 3. Ask questions: Nobody likes to be told what to do. Instead of explaining why your parent should consider moving, it can help to lead them to that decision on their own. Start by asking open-ended questions, such as: What’s difficult for you at home now? What is your greatest concern about staying at home? What would you do if you fell and couldn’t reach the phone? What would you do if mom got sick and wasn’t here to help you? In answering those difficult but important questions, your parents might realize how much help they truly need. 4. Be honest: Caring for an older parent can be a challenge. It can create family strain and interfere with your ability to hold a job or take care of your own children. If the current situation isn’t sustainable, be honest. Explain that it’s because you love them that you want to make sure they receive the care they need to be safe and content. 5. Listen: You might feel the need to make your case for a senior living community, but it’s important to listen, too, to what your parents have to say. Ask them to share their fears and hesitations, as well as what’s most important to them. By understanding their desires, you can help them find the care solution that is best for them. 6. Be empathetic: Leaving a home you love is never easy, and it’s common to experience a roller coaster of emotions when making that decision. Try to be patient. If the conversation gets too heated, shelve it to revisit at another time. You don’t want to put the discussion off for too long, but you don’t have to make a decision in the space of one afternoon. 7. Schedule a visit: Many people imagine the worst when they think about senior living communities. They’re usually surprised when they visit Heritage Communities residences for the first time, and find uniquely designed living spaces, where residents are socializing, enjoying restaurant-style meals and participating in all kinds of fun activities. Scheduling a tour can help ease unfounded fears so that you can focus on the benefits of senior living communities. 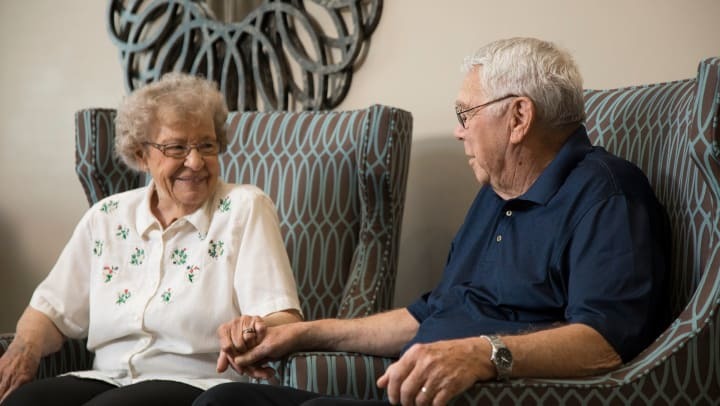 If you’re ready to help a loved one start exploring the option of an assisted living community, learn more about Heritage Assisted Living or contact us to schedule a tour at a community near you.